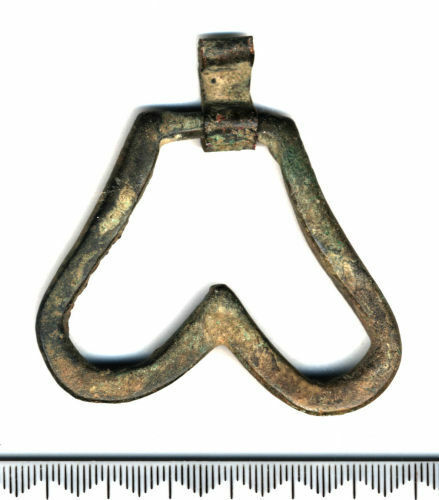 Heart-shaped drop handle from a chafing dish, similar to that illustrated by Lewis as his Type B1. Made from cast copper alloy, it is rectangular in cross-section and has a flat top and two slightly unsymmetrical lobes. Around the flat top is wrapped a length of copper-alloy strip formed into a figure-of-eight with a short straight section between the two loops. The lower loop holds the handle and the upper loop presumably served to attach it to the vessel. Length without looped strip, 48 mm; total length, 60 mm. Chafing dishes held burning coals and kept serving dishes hot; these drop handles enabled them to be carried around without gloves.